Did you know rattlesnakes live only in North and South America? 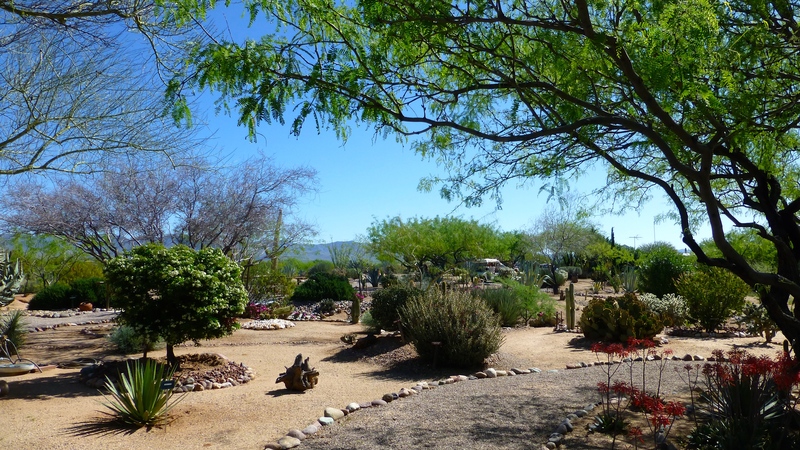 Did you know there are 36 species of rattlesnakes and 13 of them live in Arizona – the most of any state? Did you know that only 1% of rattlesnake bites result in human death? 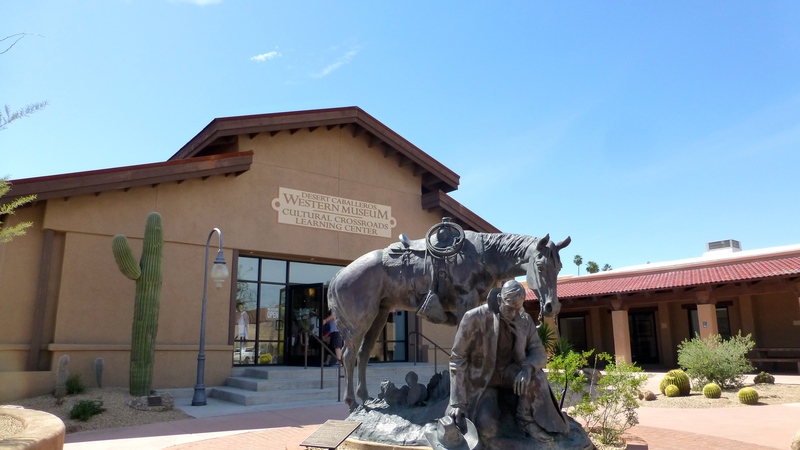 While we were in Wickenberg we visited the Desert Caballeros Museum – “America’s Most Western Museum.” We also enjoyed the old town walking tour, especially the Jail Tree. 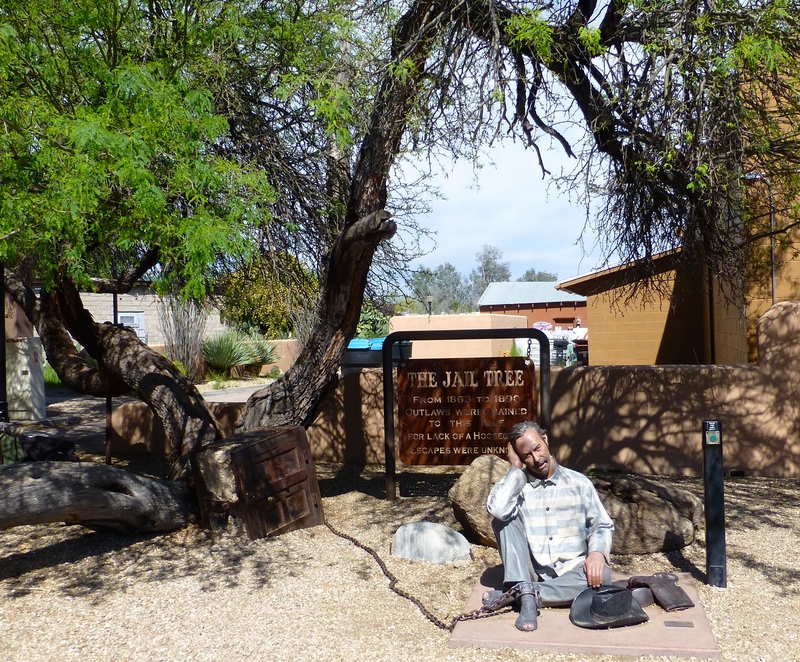 It is a 200 year old Mesquite tree to which prisoners were once chained in lieu of an actual jail. 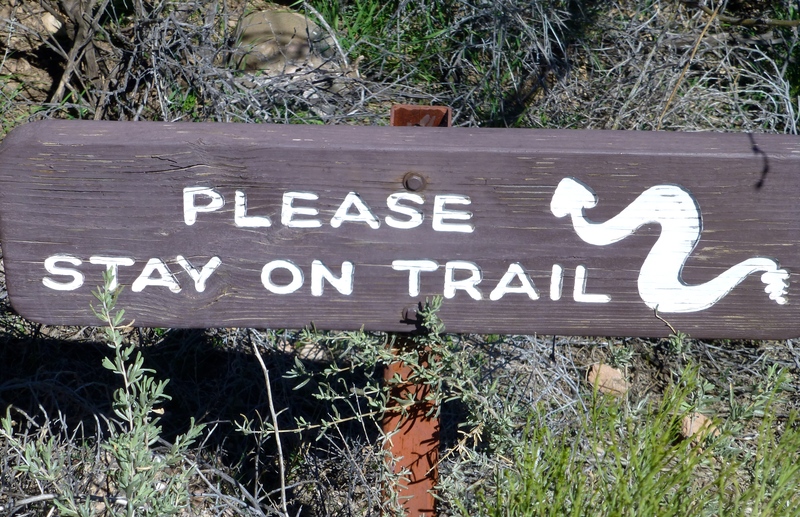 We have been staying 10 miles north of Wickenberg at an Escapees campground, North Ranch. Although the park is quite basic and the campground somewhat remote, we have had a great time here enjoying the people and the activities. 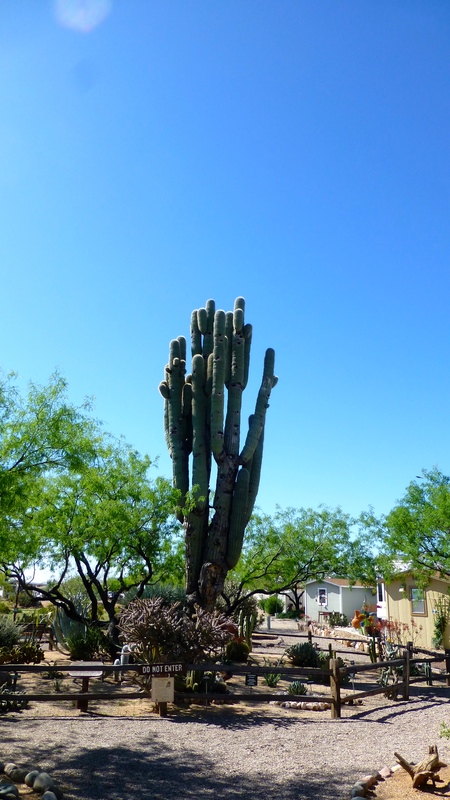 The campground has a very nice Saguaro Trail which showcases and identifies many desert plants, including a Saguaro named Methuselah, circa 1600. 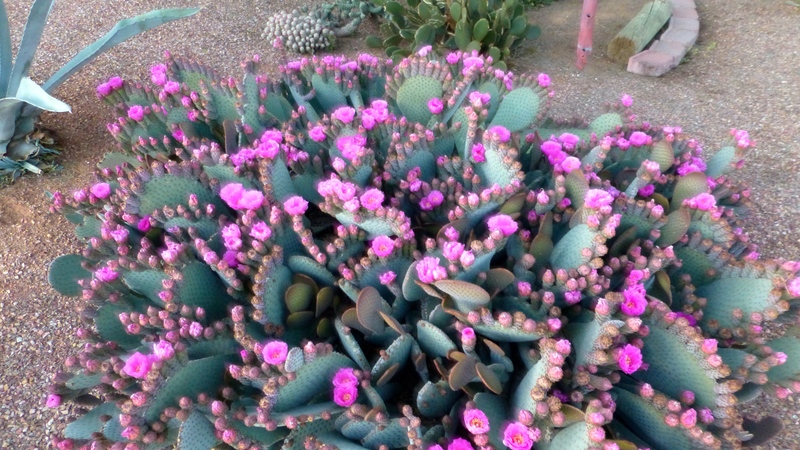 The desert blooming is such a treat! 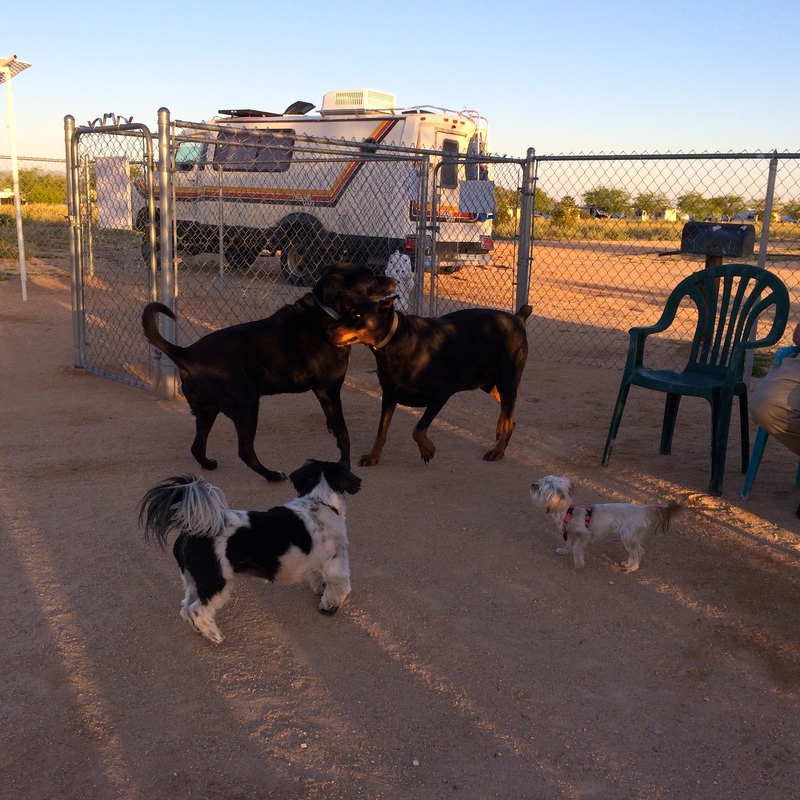 We enjoyed happy hour, pickle-ball, line dancing and the dog park. Elko playing with his buddy Ach-med! I even played Mahjong for the first time. The computer version is an insult to this very elaborate and complicated game! I’m not sure I’ll ever have the opportunity to play enough to get competent, but it was fun to begin to learn. Traveling north of our campground we went up the hill towards Yarnell. Someone got creative with some rock art! Scale is difficult in the picture, but this frog is darn big! 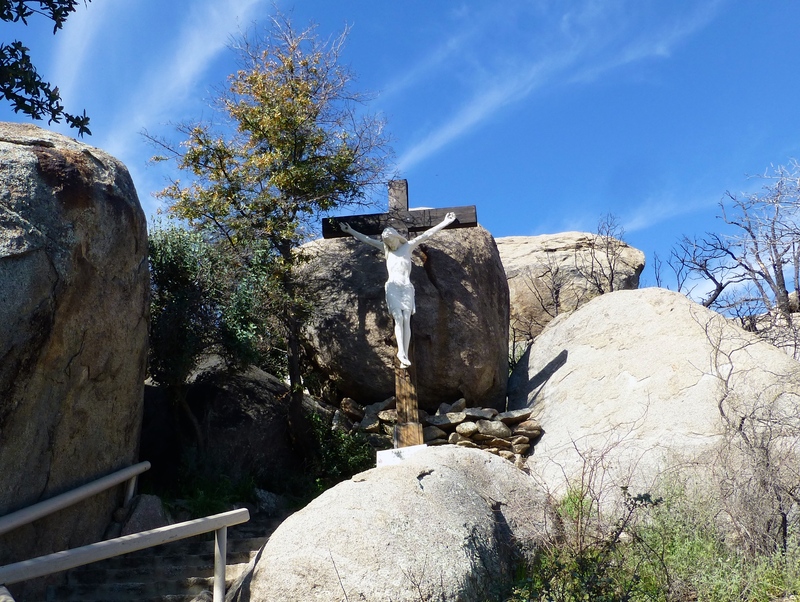 The name Yarnell may spark a memory for you in that there was a horrible fire here in 2013 which consumed 8400 acres and destroyed 129 buildings. Yet, that pales in comparison to the loss of life. 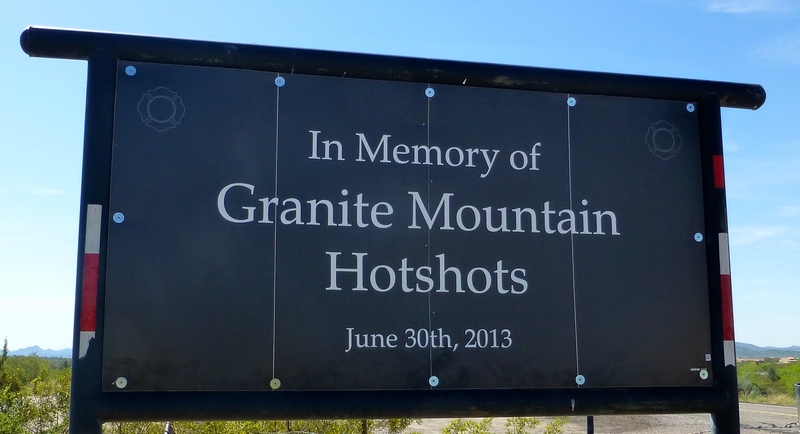 Nineteen (of 20) members of the Granite Mountain Hot Shot crew were killed near here on June 30, 2013. There are remembrances of the hotshots throughout the area. One of the things that seems so poignant is that even though hotshot crews are dispersed throughout the west, these men died about 35 miles from their Prescott home. 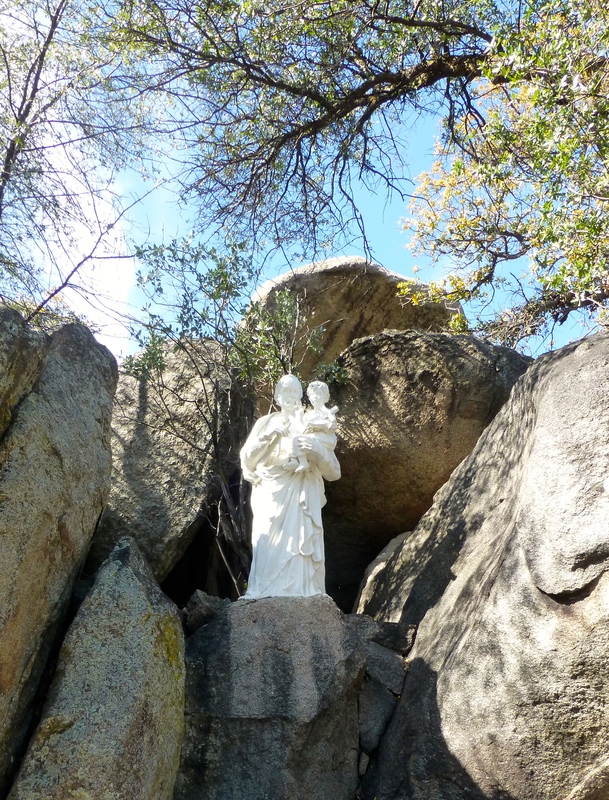 We saw remnants of the fire at The Shrine of St. Joseph’s of the Mountains. 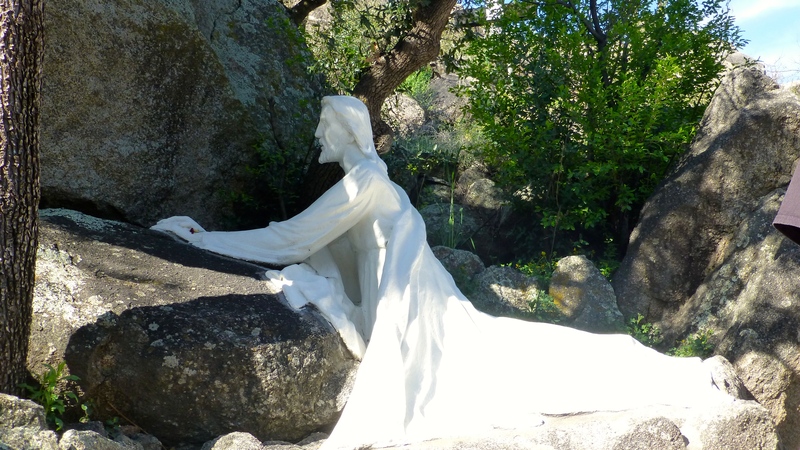 The shrine, built in 1939, includes a 14 station Way of the Cross, with representations of Christ’s way to Calvary. As you can see, the fire came very close to this station (on the right). Several buildings were destroyed at the site, but the shrine was mostly spared. 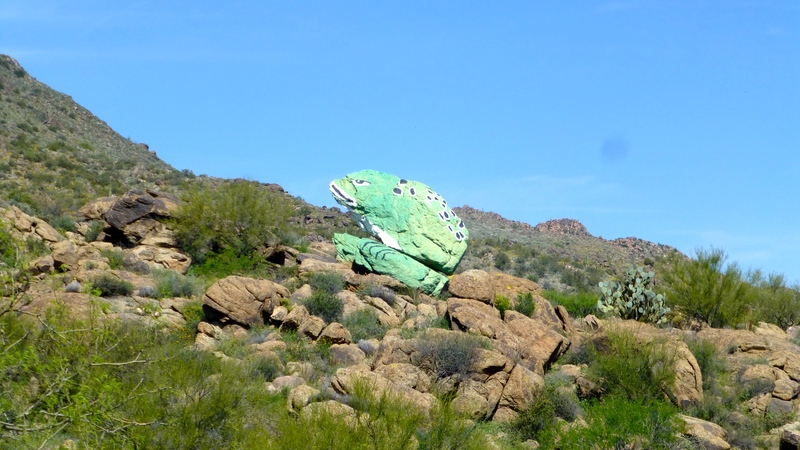 We’ve had a good time visiting familiar and unfamiliar places in Arizona. Tomorrow we leave, go back into Utah, heading towards Idaho once again. For us, all roads will eventually turn back to Boise! Still am not sure I care! Snakes are just snakes – ick! If you really want to learn how to play mahjong when you get back to boise let me know I will introduce you to my sister who is a tournament player and enjoys teaching want a be players. I would love to learn! I will keep it in mind for when we move back someday. Thank you!